This sweet summer scented cream with UVA/UVB sun filters offers effective protection against sunburns, for a more radiant tan. 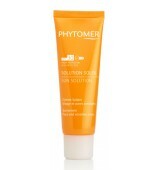 Its lightweight and melt-away texture leaves the skin incredibly soft and supple, with no sticky effect. OLIGOMER®: Pampers the skin with the benefits of trace elements. Helps strengthen and energize the epidermis. "The secret of an even and long-lasting tan can be summed up in 2 words: exfoliation and moisturization. Exfoliate your body once or twice a week and use a moisturizing cream morning and night to hydrate and nourish your skin. 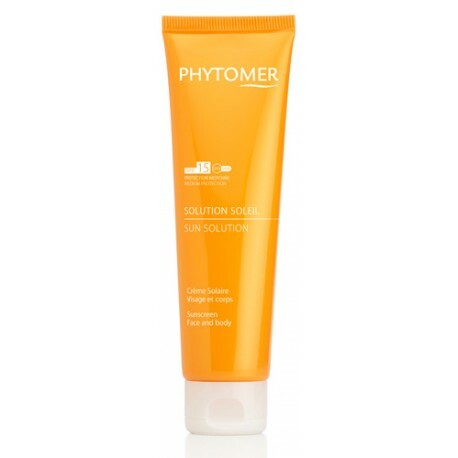 Avoid exfoliation a week before sun exposure to give your skin the chance to build up its natural protective barrier." AQUA (WATER) / EAU, ETHYLHEXYL METHOXYCINNAMATE, C12-15 ALKYL BENZOATE, COCO-CAPRYLATE/CAPRATE, ISOPROPYL PALMITATE, GLYCERYL STEARATE, PEG-100 STEARATE, BUTYLENE GLYCOL, METHYLENE BIS-BENZOTRIAZOLYL TETRAMETHYLBUTYLPHENOL (NANO), OCTOCRYLENE, DICAPRYLYL CARBONATE, PPG-15 STEARYL ETHER, ETHYLHEXYL TRIAZONE, BIS-ETHYLHEXYLOXYPHENOL METHOXYPHENYL TRIAZINE, PHENOXYETHANOL, SODIUM ACRYLATE/SODIUM ACRYLOYLDIMETHYL TAURATE COPOLYMER, ISOHEXADECANE, DECYL GLUCOSIDE, CHLORPHENESIN, XANTHAN GUM, CAPRYLYL GLYCOL, DISODIUM EDTA, POLYSORBATE 80, POLYACRYLATE-13, PARFUM (FRAGRANCE), POLYISOBUTENE, SORBITAN OLEATE, PROPYLENE GLYCOL, MARIS SAL (SEA SALT) / SEL MARIN, POLYSORBATE 20, BHT, SORBITAN ISOSTEARATE, SODIUM HYDROXIDE, TOCOPHEROL, GLYCINE SOJA (SOYBEAN) OIL.